FitBit are starting to make a name for themselves within the fitness technology market, and the launch of their £40 Zip sees the release of their most affordable device to date. Launching into the increasingly crowded fitness bracelet market (NB this is not a bracelet, but does offer similar functionality so I am categorising it as such), the Zip will compete with devices like the Jawbone UP as well as Fitbit’s own devices like the One and the soon to be released Flex. Those devices come in at approximately twice the price, and whilst they do deliver great additional features which keen fitness technology users may miss – sleep tracking and the intelligence to measure stairs climbed come immediately to mind – the Fitbit Zip does represent a fantastic way to enter the fitness technology market at a price point which is unlikely to cripple. What’s more, the Zip does deliver some nice features that you won’t find on other Fitbit devices, such as Bluetooth syncing to a host of devices ranging from your PC to your smartphone. It is also fully water resistant, which is something that you usually don’t find on this wearable tech. I have commented before on my Jawbone Up review about how staggering I found that to be, so needless to say I consider this addition to be very positive. This Fitbit offers something a, little different to typical fitness bracelets, namely it is designed to look and behave like an old school pedometer. Who said the new wave of fitness tech has to be radical and revolutionary? 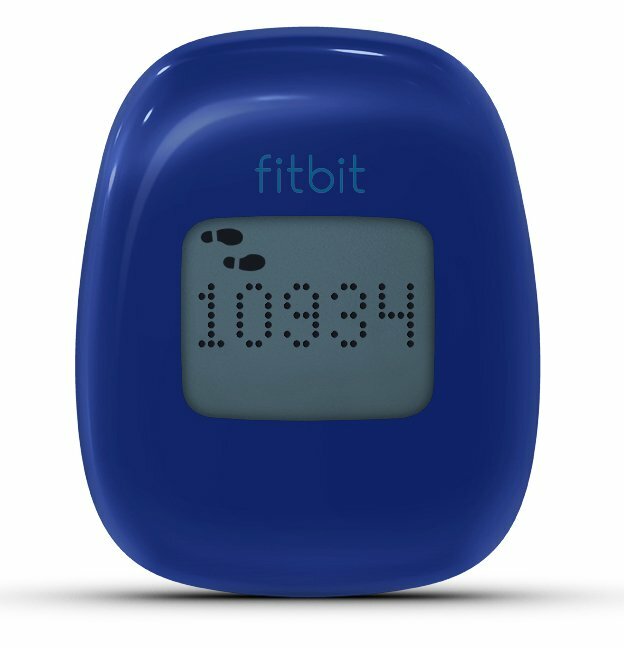 In truth, and all jokes aside, I actually believe there are more legs in going back to the unobtrusive and simple pedometer, which can be tucked away. The plastic look and feel of many of the bracelets is off-putting to some, especially people who work in very corporate environments. Sometimes a dress watch works better than a fitness bracelet in the board room. So the Zip is essentially a beefed up pedometer, encased in a silicon sleeve. Lightweight (8 grams) and unobtrusive, it is exceptionally portable. It’s a mere 1.1 inches tall and 1.4 inches wide, so tucking it away is never going to be much of a challenge. It’s worth noting that the device supposedly works whilst sitting loose in a pocket, although Fitbit envisage that the device will be worn clipped to the inside of your pocket or onto your belt fasteners. This makes sense, as it limits your likelihood of losing it whilst most likely slightly increasing the Zip’s accuracy. It does feel a bit like fitness technology devices need to be gaudy and bright, and it’s certainly true that Fitbit aren’t feeling the need to buck this trend with the Zip. It’s available in give colours, including the slime green pictured. Additionally, it is available in shades of white, magenta, charcoal and blue, with each device coming with a colour coordinated clip. The device is actually slightly reminiscent of the tamagotchi, with a small LCD screen. This screen is exactly what you wuld expect on a budget device – quite limited – and its nature means that it is useless in the dark. The battery component is housed on the rear, with a 3 volt lithium ion battery which is good for up to six months, but will most likely last for more like four months with decent usage. The Fitbit has a pretty simple premise: Log your activity levels based on how many steps you take a day. This baseline figure allows the device to deliver an estimated distance walked figure as well as a calorie expenditure estimate. The Zip tries to make you more active by displaying smiley icons when your being nice and active, whilst pulling out its tongue when it feels that you could be doing more. Besides that, it will also tell you the time and give you basic feedback. The Zip will also take the effort out of uploading the data, with the wonderfully useful wireless sync via Bluetooth. This gets rid of the need for a USB station and generally makes the device much more convenient. This is executed via a simple USB adapter, much like you are used to using for your laptop and other connected devices. The device talks to your smartphone via its app. The fully functioning iOS app delivers a great user experience, whereas the Android offerings are limited to Samsung phones at the moment. The app has recently had a significant facelift, delivering a more engaging and graphicsy feel. An interactive graph now appears when you rotate your phone on to the horizontal view, whereas portrait delivers the basic info like steps taken and calories burned. The calories burned feature is enhanced by the apps connection to food databases allowing you to track calorie consumption as well as expenditure. This allows you to instantly compare your activity against your consumption in order to model your weight and understand your BMR. All of this data breaks down into the standard daily, weekly, monthly, quarterly and yearly splits allowing for comprehensive tracking over time. Set up is a painless enough task. You need to download the required software and then insert the USB adapter when asked. The software then instructs you to tap the Zip in order to test the connection. You then need to create a Fitbit account and your all set. I am a sceptic when it comes to many fitness etch devices and their overall absolute accuracy. The Zip is possibly quite generous when it comes to the step count, and you need to remember that the steps taken are the device base data input. Some firmwares updates are coming which are expected to deliver more accurate results in this regard. As a rough comparison, the Zip is maybe estimating as much as 60% over the Jawbone UP. I guess the key point here is that the value of these devices is not always in absolutes. It doesn’t really matter if you take 1,444 steps or 1,765, what matter is the overall trends. Each device has its own calculating quirks, but consistently using the same device will let you measure over time, and that’s the key area to monitor for fitness improvements and weight loss. I actually like the old school pedometer style of the Zip, as I have never been a massive fan of the bracelets associated with the Nike fuelband and Jawbone UP. That’s down to personal preference, but I appreciate its quiet, hidden nature which unobtrusively allows me to monitor my activity. The functionality is largely impressive, especially considering the price. You’re getting the bare bones of the pricier models and that makes it a great entry level activity tracker. This is therefore an entry model, as anybody who has seen the benefits of sleep tracking, stairs climbed and other more advanced features will not want to go back. That said, many people overspend on fitness tech for their needs, so it’s never a bad idea to start at the lower end of the scale to analyse what you truly do and don’t need.